Saturday August 7th 1920 I went up town early for a treatment and got home before ten oclock. I slept in afternoon. The folks busy most of the day with the work. As we were at supper Robert Patton drove in. He and Edith went up town after supper and later he went to Chautauqua. Sunday August 8th 1920 Was in my room part of forenoon. Visited some with Robert. Late in afternoon Frank Woolf and Sophie called. They both look badly. Robert started home at 2 oclock. After we had a bit of supper Lydia went to bed with head-ache. Monday August 9th 1920 I got up earlier. Packed up my things and Edith left her work long enough to go to the depot with me at 10.30. I went up in Peoria for my dinner. But did not stay long as it looked like rain. Got to Bureau Junction at 6.20 and left at 8.15. LeGrand met me. I was not very tired although it was a hot day. 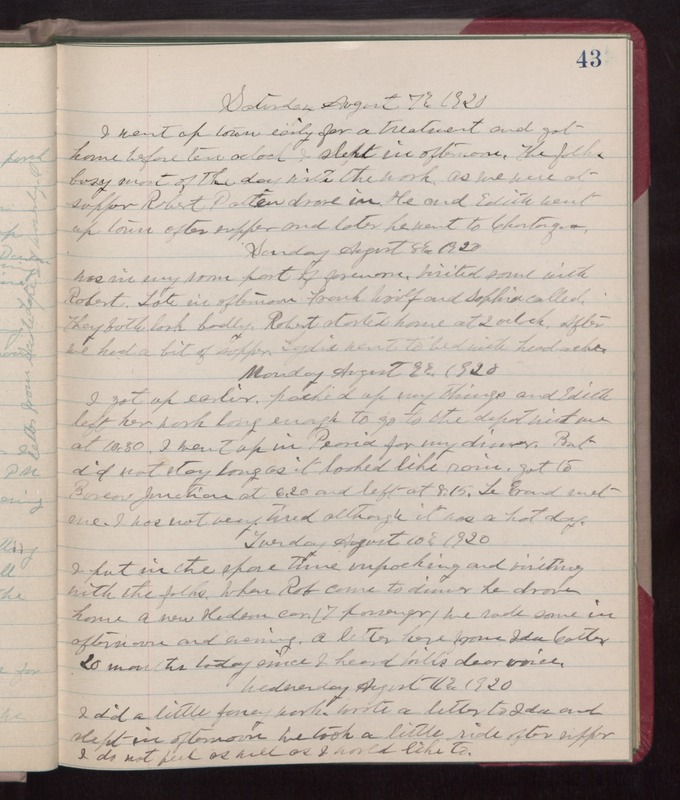 Tuesday August 10th 1920 I put in the spare time unpacking and visiting with the folks. When Rob came to dinner he drove home a new Hudson car (7 passenger). We rode some in afternoon and evening. A letter here from Ida Cutler. 20 months today since I heard Wills dear voice. Wednesday August 11th 1920 I did a little fancy work. Wrote a letter to Ida and slept in afternoon. We took a little ride after supper. I do not feel as well as I would like to.